Epaphras, pastor of the church at Colosse, reported to an imprisoned Paul that false teachers had infiltrated the Colossian church and were poisoning it with Gnostic doctrine. 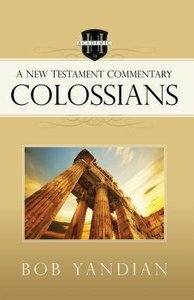 Paul's response was the book of Colossians, a rich concentration of Pauline revelation concerning the supremacy of Christ and the way believers are to live because of it. In this verse-by-verse commentary, Bob Yandian examines human philosophy, false religion, and God's approach to eliminating them both from the church, so believers can live in the freedom of true Christianity. Book jacket.